Ignore its ugly warehouse exterior and the fact its located in a business park, because once you set foot inside, your eyes will light up, a smile will splatter across your face and gang of bikes will greet you into the chic and modern Krazy Horse Café. If you like the custom, classic and old school motorbike vibe, with a modern twist, I highly suggest you pay this place a visit. 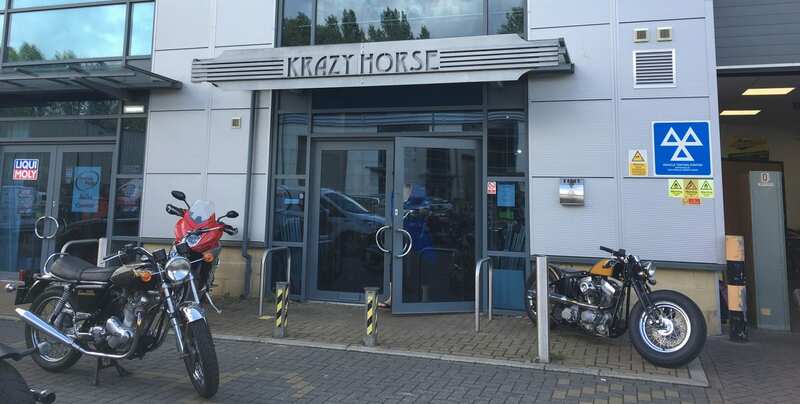 In my opinion, what the Krazy Horse Café tries to achieve and the vibe it offers, is very similar to the Bike Shed in London, with one key difference; its location. Rather than forcing you to enter jam packed central London, this place is situated in peaceful Bury St. Edmunds, bang in the middle of English countryside. So, whereas the Bike Shed is perfect for an afterwork drink, the Krazy Horse Café offers you the chance to make the most of the weekend and take a long route around Hertfordshire and Essex to get there. Best of all, the route is windy, well paved (for England), surrounded by beautiful landscape, passes quaint English villages and is fun! It is also the perfect route to quickly pop in and say hello to the Hideout Leather girls, all whilst enjoying a fantastic rideout! Although the café does not have the rustle and bustle that the Bike Shed, or for that matter, any venue in London will thrive off, there have always been many people looking at bikes, trying on clothes and eating when I have been. There is certainly a calm yet vibrant atmosphere at the Krazy Horse Café, without the need to shout at one another over a drink. Lined with wooden floors and with the low tones of Bruce Springsteen playing in the background, this is a very enjoyable place to go around looking at bikes. Not only will you find some beautiful classics, but Krazy Horse also lines its shop with customised beauties, and if you are lucky, you can see them working on these bikes in the garage. The bikes on offer range from crazy, flashy colours, to the more classic and traditional old school look. It is clear that this is where this place excels. Naturally, as such bikes demand, the shop on the second floor offers a range of cool printed t-shirts and shirts, open helmets, rocker leather jackets and wicked boots. Although the shop is rather small, it is packed with chic, modern, yet classic looking items. Not only do the helmets match the bikes below, but all the accessories are trendy too and everything flows beautifully. There is no denying that prices are a little high, but the clothes are hip, fashionable and include the best brands such as Belstaff and Norton. One thing I would mention however, is that although there is wheelchair access into the lower ground where all the bikes are on display, there is no such access to the second floor. I asked one of the workers last time, and apparently the only way to get to the shop and the restaurant is by walking up the rather steep stairs – something to bare in mind should you only go for a mooch and bite to eat. Upstairs also plays host to the Café. This area is located right the shop, with certain tables backing onto some of the rails. To be honest, I am not sure how happy I would be buying clothes that could be riddled with the stench of fry-ups, or laden with oily finger stains on them, but that is just my opinion. I also find that the shop swamps the majority of the second floor and consequently, the eating area is very cramped, with the tables very closely packed together. For a bikers café, I cannot say much detail has been placed on providing areas to put gear down. As for the café itself, it is certainly very ‘hip’ and acts more as an American diner than anything else. It is however, very clean. You order at the bar, from a very English/American menu, filled with only with oily and carby food options, and your name then gets called when your food is ready – I must say that the system works well. As for the food, I was deeply disappointed. Inigo and I ordered two versions of their English Breakfasts and they were pretty awful. The plate was gleaming in grease and I could see that every element was swimming in a pool of oil. The sausages tasted like they were made of 60% fat more than anything else and the bacon was not much better. In fact, the best part was the white toast with butter. Although the portions were good, I did not enjoy the food at all. I felt like I was drinking oil and could feel the fat and cholesterol building in my veins; not pleasant. Inigo also ordered a coffee which he could not finish as it was so poor. Overall, not the experience we were expecting considering how flashy and well put together the entire establishment is. In the past, Inigo has eaten the baguettes and mentioned to me that they were far nicer and what he will be ordering again. Personally, I will not be eating at the Krazy Horse Cafe again. Having said all this, the entire meal came to £12, so considering the price, perhaps I should not have expected anything more extravagant. It has to be said that this is a nice place to visit. The atmosphere is pleasant, the bikes are incredible to look at and the shop is well set out and appealing. However, this is a food review and quite frankly the food was terrible. Every item that food came out of the kitchen, it was drenched in oil or made from packet powders – nothing like the other places I have written reviews about. I would certainly recommend the Krazy Horse as a good stop of point during a good countryside ride, but not for its culinary skills.